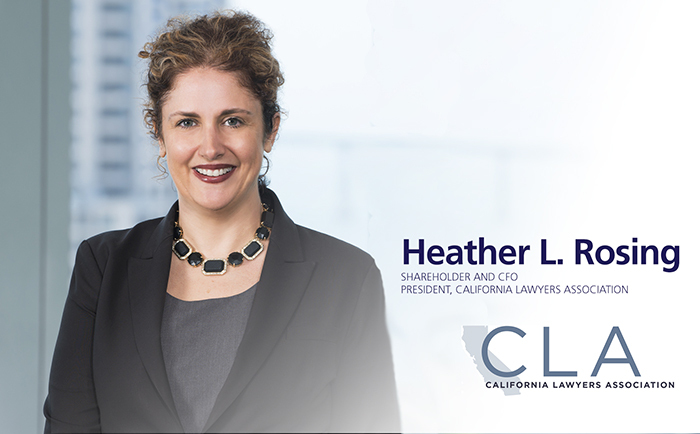 Klinedinst shareholder Heather L. Rosing (pictured) was elected President of the California Lawyers Association (CLA), the nation’s second-largest professional association for attorneys. CLA is the new home of the Sections of the State Bar of California, as well as the California Young Lawyers Association. SAN FRANCISCO, CALIFORNIA – Klinedinst is pleased to announce that shareholder and CFO Heather L. Rosing has been elected President of the California Lawyers Association (CLA), the nation’s second-largest professional association for attorneys. Effective January 1, 2018, San Francisco-based CLA is the new home of the Sections of the State Bar of California, as well as the California Young Lawyers Association (CYLA). From day one, CLA has over 64,000 members, ranking it in size second only to the American Bar Association. When factoring in the number of CYLA members, that membership number swells to over 100,000 California attorneys.